The use of electronic animal tracking has revolutionised marine science and conservation; in recent years, animal tracking has become incredibly sophisticated and allowed scientists to observe behaviours that had so far remained completely unknown. Tracking devices are getting smaller allowing them to be attached to a wider range of species, whilst at the same time, battery technology is improving which allows the recording of longer time series of data. Sensors are also becoming more sophisticated so that scientists are now able to observe not just the location of tagged animals, but also their speed, acceleration and even, in the case of sea turtles and seabirds, whether they are in or out of the water. From this wide range of data, scientists are able to recreate the most detailed pictures of animal behaviour. Prof. Graeme Hays of Deakin University with Dr. Nicole Esteban from Swansea University and Dr. Jeanne Mortimer has been studying turtles in the British Indian Ocean Territory for many years. Their work, which is an integral component of the Bertarelli Foundation’s marine science programme, has been utilising satellite tracking technology on Green turtles which has shown them travelling as far as the coast of Somalia – over 4,000 km away to the west. Dr. Esteban recently returned to BIOT to attach satellite tags to Hawksbill turtles for the first time; once the data from these tagged animals are analysed it will help give the team an even better understanding of how the Territory’s MPA protects sea turtles in the Indian Ocean. Hello from Danger Island in the Indian Ocean! I am writing this blog from our campsite by the beach, sitting amongst a grove of squat, leafy beach heliotrope full of small, white moths and unexpectedly arboreal hermit crabs. Today is thankfully overcast which gives us a break from the intense sunshine and lessens the sweltering heat. The sea is relatively calm at the moment, but the coral reef fringing the island means that there are always white-tipped breakers rolling and crashing into the shore. We arrived here six days ago with the aid of British military forces and a British patrol ship. With their help we unloaded camping gear, drinking water, food for two weeks and all our science equipment. 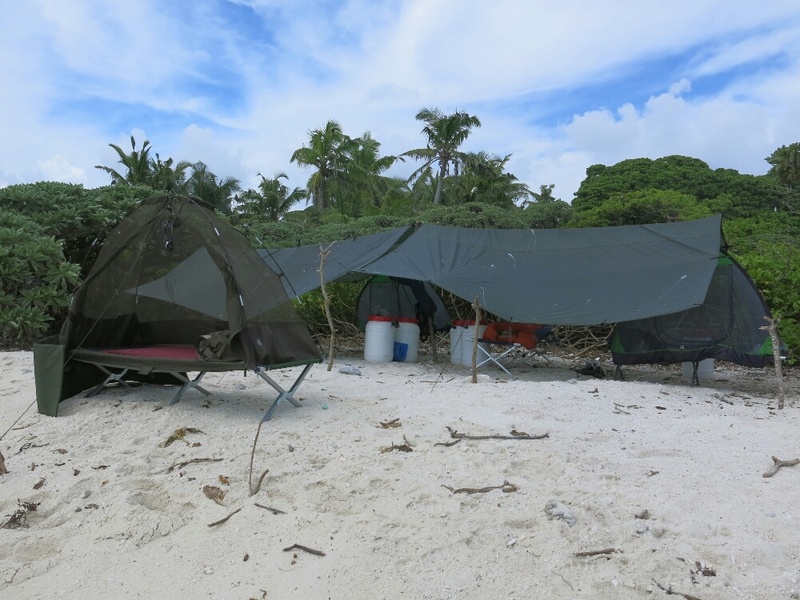 It took us the rest of the day to set up our camp and the following morning we circumnavigated the island to assess potential tagging locations. That afternoon we began tagging red-footed boobies with tracking devices, and by the end of the second day we had tagged 33 nesting birds. Once the red-footed booby tagging was complete we moved on to the brown boobies, which are slightly larger and nest on the ground under bushes rather than in the trees. We have now tagged 15 of these and hope to begin retrieving the tracking devices tomorrow! In addition to all the tagging we have been conducting twice daily monitoring of nest attendance at all of our 33 red footed booby study nests, and erected a long-term camera trap near a collection of booby nests. 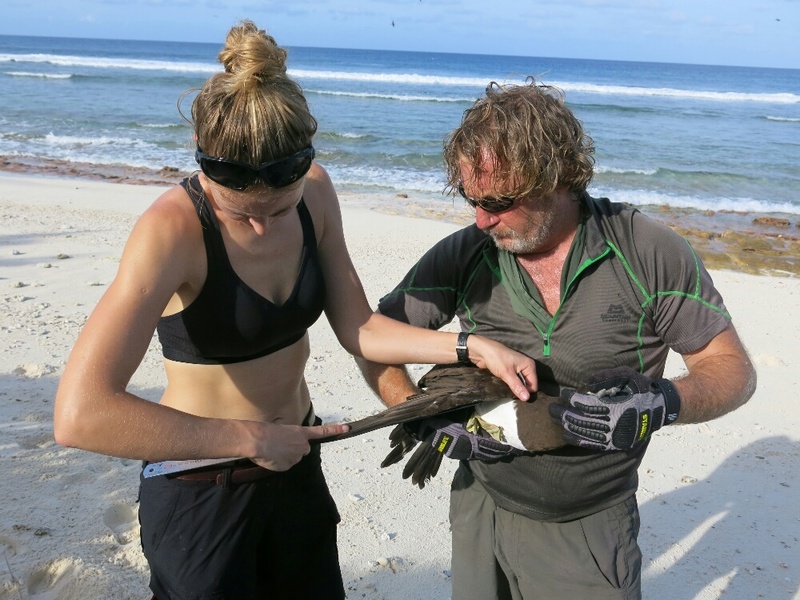 The tag recovery phase of this expedition has now begun; this morning we collected six of our devices from red footed boobies, hopefully full of interesting data! As the afternoon passes it should get cooler and we can head out to gather more tags, until then we are recharging our electronics with portable solar panels and recharging ourselves with powdered isotonic drink!